A two-tank dive on the most famous wreck dive in the Caribbean, the RMS Rhone, which was sunk in 1867 by a rogue hurricane. A resident turtle weighing about 800 lbs, a nurse shark and a 6 foot green moray eel are often encountered on the Rhone. The first dive is an exploration of the bow, which lies mostly intact in 75-80 feet of water where this historical British mail steamer sank in an 1867 hurricane. The second dive is a tour of the stern, passing by several historical points of interest such as the lucky porthole and the captain's silver teaspoon. Abundant fish life and encrusting coral will make this excursion the highlight of your cruise. I connected with Sail Caribbean directly and Mike Rowe, Course Director of Sail Caribbean, graciously arranged to have an instructor along so we could do our first two certification dives on this excursion that is usually reserved for certified divers. Unfortunately, things did not go as planned. After meeting the excursion rep and completing all the paperwork, our party walked to the marina and boarded the dive boat. We got our referral paperwork out and that's when things headed south. Our referrals were NAUI and there was some sort of problem that prevented them from taking us on the trip since we didn't have PADI referrals. I had explicitly confirmed with our dive shop in advance of the trip that this would not be a problem. And Mike never even asked about the type of referral when I was making arrangements. Needless to say, I was furious when they forced us off the boat. They wouldn't even let us ride along and snorkel. We missed out on doing any excursions on Tortola because I had to spend the next few hours on the ship trying to modify our dive plans for the next few ports. Ironically, it was a 4-mile jog on the top deck of the ship in the 90 degree heat that "cooled" me down. I had planned a longer run, but decided I better not push my luck. At least I had the refreshing pool to cool off in. By the time the ship sailed away from Tortola at about 5pm, I was more than ready to move on. Martha and I kicked off the evening with the official Cruise Critic Meet & Mingle in the Cosmos Bar & Lounge at sailaway. This was by far the most active Cruise Critic Roll Call I had ever participated in and the M&M was a big hit. We connected with a number of people that we would later team up with for excursions, including Neil & Jerry, AJ & Jeremy, Deb & Ken, and Jeremy & Marion. Afterward, we joined up with Heather and Emil for some pics around the ship, including many with the infamous and romantic LOVE sculpture (see pic above) by Robert Indiana. At dinner, we met our tablemates Tony & Diane Townsend who are from England. It was quite a treat to share a table with them. We grew to like them more and more each evening. 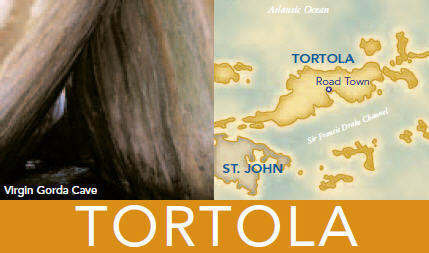 For details and pictures from our previous trips to Tortola, see our 2007 site and our 2008 site. We were considering the following excursions when we did this cruise with Princess, but we ended up just catching a shuttle over to Virgin Gorda ourselves and taking a taxi to The Baths. There were plenty. There is no need to waste money on a tour here unless you want to hear the tour guide spiel. You can even rent snorkel gear down on the beach. Unfortunately, the underwater visibility was pretty bad in 2008, so snorkeling was bad. It did give me an opportunity to explore the rocks though, which I wanted to do on our 2007 trip.